An artistic sense of perfection, vivacity, and alertness lead Dr. Fady el Helou, a dental surgeon specialized in implants and aesthetics, and founding president of Murex d’Or. With his brother, Dr. Zahi el Helou, the two doctors share the same passion for this major event, which is in its 19th year in a row. Dr. Fady el Helou counts his memories, impressions, and confidences to Prestige. You are two brothers united by the same medical profession and the same passion for art … This coincidence is rare. What do you think? I think, on the contrary, this is quite common nowadays. We are Zahi and I, two brothers born in the same family. We grew up both in the same school, shared the same atmosphere and the same tastes … In the same way, we studied medicine at Saint Joseph University, then specialization in Paris and until now, we are always together. The Rahbani brothers, who are a typical example of a united family, insisted on expressly quoting us in the media as a model of united brothers. 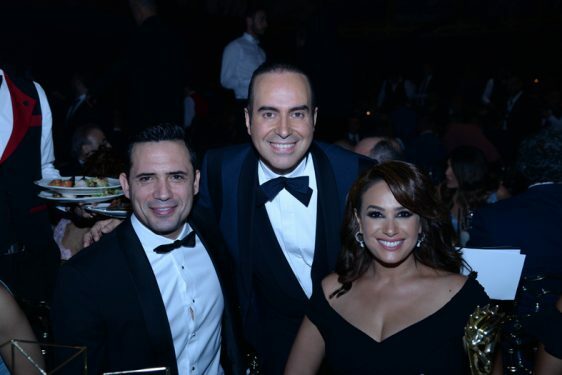 In an edition of the Murex d’Or, you improvised a speech and award presentation to Melhem Barakat. Tell us how and what were your impressions at that time? Indeed, this happened during an edition, when the director Tony Kahwaji, supposed to announce the name of the honored personality and pronounce a word of circumstance, was absent. As the edition was live, the producer hurriedly handed me a paper bearing simply the name of the honoree, Melhem Barakat. I confess that at that moment I had the stage fright, I was surprised, the experience was unprecedented. Then, as it was repeated often enough, I ended up reacting spontaneously. It must be said that the real fear that increases each year, is the one we have, Zahi and I, as we approach the event, with many problems to solve, so many challenges, to be at the height of the event. It’s enormously stressful. What does artistic fame give you? and medical reputation? The artistic fame gives us more celebrity. It broadens the circle of our public relations and our friendships. At the professional level, reputation brings appreciation, satisfaction, and love of people. On both levels, the beautiful reputation provides more success and respect. And this appreciation gives us a new breath and new energy to continue. Dr. Fady el Helou with Dr. Zahi el Helou. What is your most beautiful memory of the Murex d’Or? a situation that you would like to evoke? It is difficult to grasp the best memory. 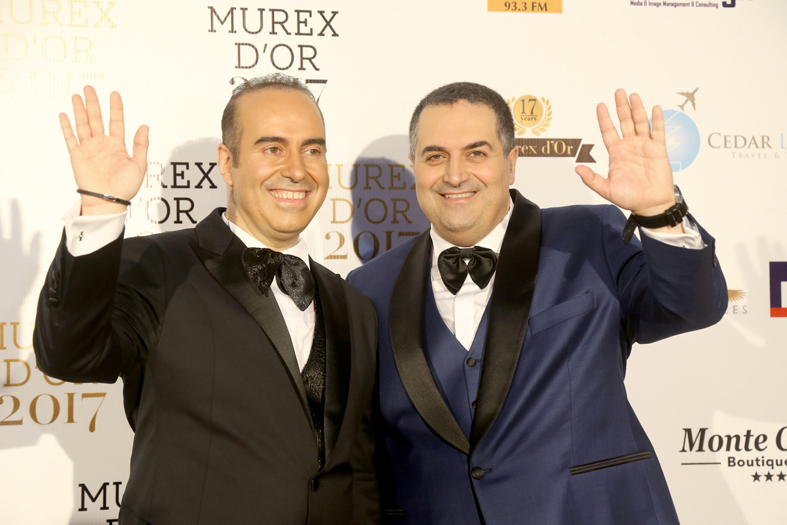 From one year to another, and in every edition, there are memorable moments that make up the history of the Murex d’Or. In 2005, I remember the late Salwa Katrib who accompanied her daughter Aline Lahoud to make her appearance. This memory is as beautiful as sad since the following year we lost Salwa. Also in 2005, another appearance that remains engraved in my memory, when Georgina Rizk, Miss Universe 1971, appeared on the plateau of the Murex d’Or after a long absence. The event resonated broadly, as the audience was very happy to see her on stage again. Another highlight of the Murex d’Or, the improvisation made, in 2007, by the stars Assala and Chirine Abdel Wahab who played Fayrouz’s song, «Bhebback ya Lebnan», and the immediate improvisation, in response, of Waël Kfoury, with the song «Lebnanya Qot3et Sama» by Wadih el Safi. What will I say about this medley, in 2008, which brought together the great artists Assala, Carole Samaha, Hussein el Jasmi, Marwan Khoury, to honor the legends Zaki Nassif, Wadih el Safi, Sabah, and Melhem Barakat? And in 2010, on the occasion of the Murex d’Or 10th anniversary, when we chose the best outdoor scene in Byblos, to welcome big names, like Alessandro Safina … How not to remember too such beautiful memories of international celebrities that one dreamed of seeing up close, and who have honored the scene of the Murex d’Or, such as the Egyptian star Naglaa Fathi, and the Italian stars, Claudia Cardinale and Ornella Muti? Do you have the same friendships as your brother in the artistic field? Yes, in fact, we have the same friendships because we know the same people. However, during the meetings, we obviously share the tasks. 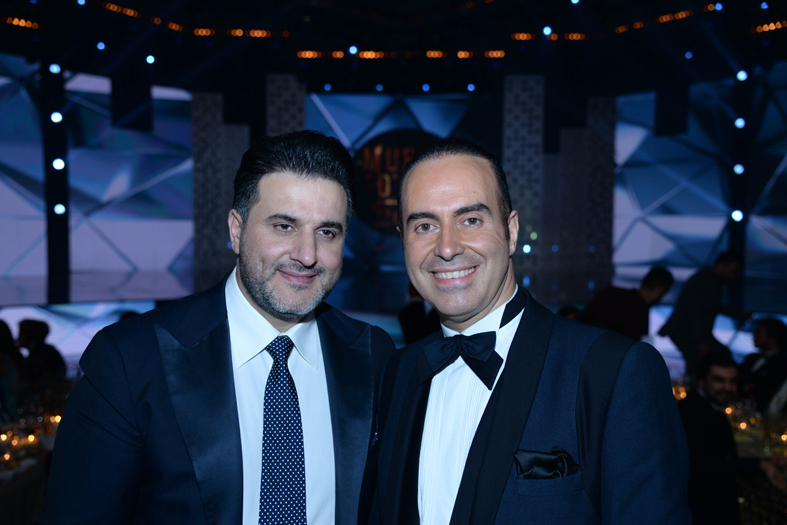 Fady el Helou with star Melhem Zein. What quality you share with your brother, and what flaw keeps you apart? In terms of quality, we both have the same tastes and the same artistic passions. In terms of flaw, I will say that I’m just more organized than Zahi. What are the ingredients of success in life, in your opinion? Love, even passion and some organizational skills. Financing is very important, but sometimes the project fails, even if the budget is big because there is a lack of spirit and taste somewhere. On the other hand, we can, with a small budget, succeed a beautiful project when the goal is fixed, desired and loved. The equal repartition of tasks is also important. What is the great love of your life? Family, my parents, my brother and his family. I am not perfect, but I am rather a person too perfectionist. However, I try not to be too demanding. Dr. Zahi el Helou, Minister of Tourism Avedis Guidanian, Miss Lebanon Maya Reaidy and Dr. Fady el Helou. Dr. Zahi and you have always worked in tandem. Did you ever have to decide on an embarrassing situation on your own? This has happened to me many times, especially when Zahi is traveling for a convention or something. I remember this campaign of virulent aggression carried out a while, against the Murex d’Or. Zahi was away. I faced it alone, responding firmly and succinctly, as needed. The family for Dr. Fady el Helou is … Security, serenity, confidence. Your hero in life … Jesus Christ. Little children, our parents were our heroes. Growing up, we added to them the exceptional people who created a positive phenomenon in life, like Pope John Paul II. If you were not Dr. Fady el Helou, who would you have liked to be? Dr. Fady el Helou. I am fully convinced of myself, of my ideas and of my situation. What would you say to the new talents who make their entrance every year? The Murex d’Or gives a chance to every new hope. 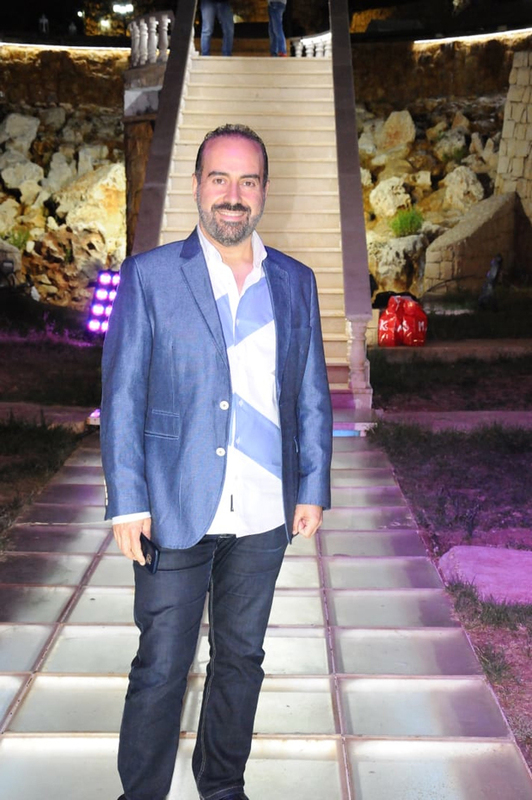 Many stars have made their footsteps on the plateau of Murex d’Or, like Yara, Elissa, Nancy Ajram and many others. Each year, a category dedicated to young new talents, is promised a beautiful artistic future. Which personality has disappeared and you wish to have honored her before her death? In Lebanon, I will mention the actresses Hind Abillamaa and Ferial Karim, whom we have honored posthumously. There is also the star of the Arabic song Warda, who was supposed to come to Lebanon in 2010, to be honored. The trip has been postponed, and the star has disappeared. Tunisian actor Zafer Abdeen, Dr. Fady el Helou, Tunisian actress Hind Sabri during a Murex d’Or evening. And what personality would you like to honor and you have not been able to do yet? I will obviously say our diva Fayrouz that we would like to meet. We particularly appreciate her works and we will continue to dream of seeing her. A word or a situation that has marked you most … Beautiful memories have marked me, especially when the honored person pronounces a touching word on stage. I remember actress Leila Hakim who said, “I’m very happy to receive this award in my lifetime,” referring to all those stars who die before being honored. Visiting sick artists, such as Aliaa Nemri, Leila Karam and Saad Karim, also struck me, because they are people who deserve a tribute before they disappear. What criteria do you rely on to honor a personality? We rely on their important resume in the eyes of the public, the media and the cultural community. It is the story of Lebanese, Arab or international cultural and artistic works and their impact on the public and the world of culture. Generally, we give prizes to artists who have years of experience and success. But we also honor new talents who have created their first work of art. In any case, we always take into account the state of health and the age of the person to be honored. 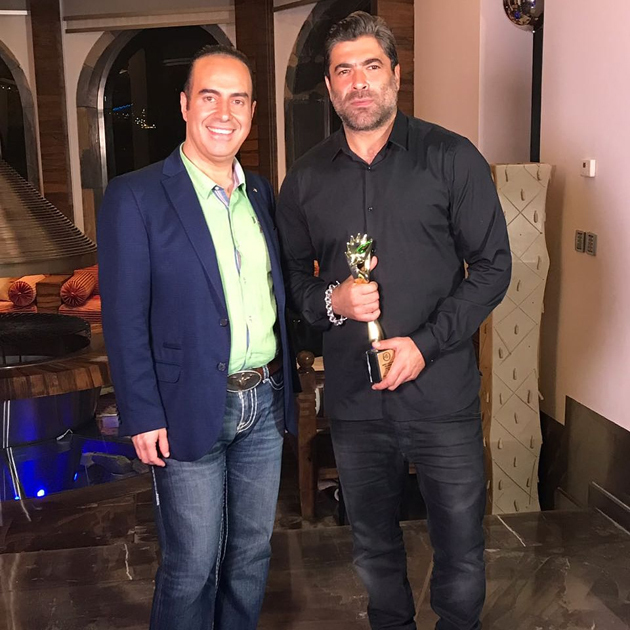 Dr. Fady el Helou with Lebanese star Wael Kfoury. If you could go back in time, would you have organized the Murex in the golden age of Beirut in the 60s? Certainly. We would have had the privilege of honoring more great names that I appreciate enormously, like Mohamed Abdel Wahab or Abdel Halim Hafez. It is true that we currently have very beautiful works of art, but the charm of this bygone era lies in the style, direct, simple, spontaneous … We are always looking for these old names that made the history of Lebanon and which have unfortunately become rare or physically unable to go on stage. Star Melhem Zein, Minister Ghassan Hasbani, Lady Madonna, Dr. Zahi el Helou, Jamal Fayad and Dr. Fady el Helou. One last message? I thank Prestige, in the person of Mrs. Marcelle Nadim, for her dedication and total support for the event. 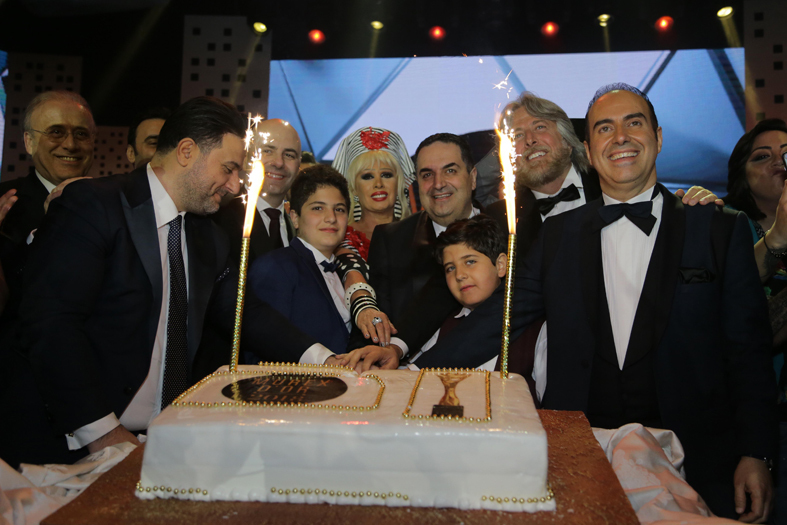 I hope that the Murex d’Or will continue to be an annual meeting place for personalities from the artistic, cultural, and media worlds. A date symbol for happiness, beauty, and appreciation of the great names, who made the history of Lebanon, of the Arab and international world. This meeting with the stars of the world, which is important to revive the country’s tourism and provide a source of light for young talents, to prepare them for a better future. The 2019 edition will be special, until that of 2020, when we will celebrate together the 20 years of success of the Murex d’Or. Interview Conducted by Mireille Bouabjian.